Read on for answers to some frequently asked questions and e-mailed questions. Just click on the question below to be taken to the answer. Please let me know if you have any additional questions that you can't find answers to here! I'll be happy to answer them. The information on this website was formulated through Renee Cao's actual experience. For those technicians seeking information, please do not regurgitate the information to potential clients as if the information you have read here is your own personal knowledge. It has come to my attention that some technicians are using my exact words to describe to their potential clients the information that I have provided here to give them a sense of false security that the technician knows what she/he is doing. I provide advanced training to technicians who would like to learn to do corrective work so please get proper training instead of using your clients as guinea pigs. I have clients with botched up work who have done their homework and were convinced that the technician who worked on them said all the right things and are experienced, yet they still end up with botched up work. Please check references, visit the work place, visit the website and read testimonials as well as speak to former clients. Also, pictures speak a thousand words. Saying that the technician is certified is not enough, you must see their work. You have only one face, please don't take a chance! Will I need a touch-up? Answers to Your Questions. . . everything from permanent makeup to tattoo removal to scar treatments !!! What is the best method to remove a bad microblading procedure? Does your procedure completely remove a tattoo? Can give me some tips how I can remove some permanent make up.. I'm an African American who has really dark under eye spots can you help me get rid of them.. Please tell me if permanent makeup really IS permanent. Do you know of any trained professionals in Oklahoma? I am interested in having permanent eyebrows. Is it like getting a tattoo on some other area of the body? I am thinking of have perm makeup applied to my face however the info I have received so far is Greek to me. Can you please answer these questions for me in plain English? Can you do tattoo removal on African-Americans? Permanent makeup is basically tattooing cosmetics and sometimes referred to as micropigmentation or intradermal cosmetics. Like tattooing, permanent makeup involves implanting colored pigments into the upper layers of the skin. Various methods are employed to implant the color. These include the hand-method, traditional tattoo coil machines, and the more modern pen or rotary machines. I use both the traditional coil machines and the pen machines depending on the procedures that are being performed. Applying permanent cosmetics takes varying amounts of time depending on the procedure requested. Generally, I like to spend at least an hour with the client filling out the necessary forms, explaining the whole process step by step, working with the client on selecting the appropriate colors, and depending on the procedure, eyebrow shaping or lip lining to accentuate the client's facial features. After the consultation phase is completed, the topical anesthetic is applied and I allow 30 minutes for it to take effect before implanting the permanent cosmetics. The actual implantation of the color itself will take 30 to 40 minutes depending on the procedure. All permanent makeup colors fade over time. Lighter colors will fade sooner than a medium or darker shade. How long the permanent makeup will last depends on many factors; i.e. 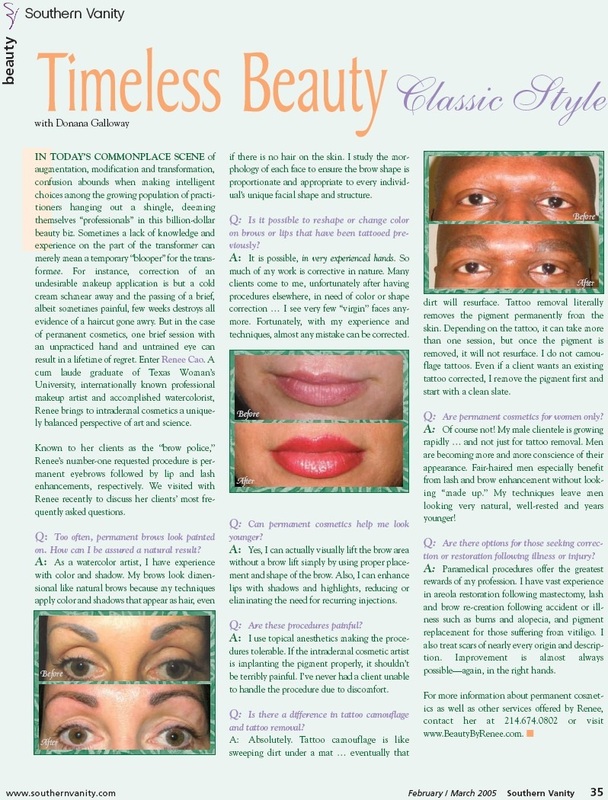 medications, UV light, smoking, extreme climate, skin type (too oily, too dry, too thin, too thick), conditions of the eyelash and eyebrow hair follicles (ie, trichotillomania or alopecia), changes in body chemistry, and using products that exfoliate or have the ability to lighten the skin or hair may all be possible factors that contribute to fading your cosmetic tattoo. Permanent makeup, like paint on the house, needs to be refreshed. For instance, eyeliner may need to be refreshed every 2-5 years while light to medium eyebrows might be 1-3 years. Permanent cosmetic pigments fades faster than body tattoo inks. Body inks may last forever. In the last 10 years, better and safer pigments have been formulated for permanent makeup which fade faster so that they can be refreshed after a couple of years so new shapes can be applied without having to go through a damaging removal process. Though each person's pain threshold is different, with my technique and the application of a topical anesthetic, my clients feel at most a mild discomfort, minimal to no bruising, and minimal swelling of the area. Avoiding potential transmission of infectious diseases is extremely important to me so I employ proper sterilization and follow strict sanitary guidelines. These include using new and sterile needles for each client. I NEVER reuse needles because the reuse of needles without proper sterilization techniques can result in the transmittal of many infectious diseases. I use new gloves for each client and I sanitize the entire area after each client. Are there any side effects and how long before it heals? During the procedure, there may be some bleeding so it is encouraged that blood thinners such as aspirin , caffeine and alcohol not be taken prior to the procedure. There may be some swelling of the treated area after the procedure that will go away in 2 to 7 days. This swelling will cause the eyebrows or lips to look slightly uneven, but once the swelling completely goes away, the unevenness will also go away. There may also be some tenderness for a few days afterwards. The color may be much brighter than the final color for the first 6 to 10 days but will soften up eventually. The healing time mentioned above will vary slightly for each person and procedure. Some clients have had procedures performed in the morning and returned to work that same afternoon. An after-procedure care sheet will be given to each client, but in general, you must keep the treated area out of direct sunlight, keep the area clean, and do not pick any of the scabs that may develop. A touch-up is just touching up areas where the color did not implant fully. It is also a time where we can fine-tune or tweak the final look. I recommend that the skin not be treated again for a minimum of four weeks and ideally six weeks when it is completely healed and any color has fully appeared. Eight weeks is recommended for a lip procedure. Microblading (or eyebrow embroidery) is a relatively new, manual method of implanting pigment. It is done using a very fine blade to deposit pigments into the epidermis. This method is generally used by technicians who do not know how to create the fine hairline strokes with a traditional coil or rotary machine. Microblading has a short learning curve so it is easy for a technician to learn. However, the technician must still understand the artistic side of brow shaping and how brow hairs naturally grow. Because it is a manual method, the color is implanted into the superficial dermis of the skin. Therefore, the color does not last as long as permanent eyebrows done via the traditional method. Colors done via microblading tend to last for a year or two but recolors are suggested to be done every six months to keep the colors fresh and hairline strokes sharp and defined. What is the best method to remove a bad microblading procedure? I had it done about 24 hours ago. Is the salt saline solution the best? Unfortunately, with the popularity of eyebrows microblading, we have been bombarded with these same questions on how to remove it or to fix it. Corrective work has become more than 75% of our current business. The problem with microblading is that many people are jumping on the band wagon to offer the service and do not have proper training. They take a 2-5 day course and start a Groupon business or add it to the nail or daytime spa. It is very scary because it is a very invasive technique requiring a blade to cut into the skin and pigment is then rubbed into the cut as opposed to using the needles the traditional method which takes years to master. In microblading, if you can hold a pencil, you can cut a line with the blade and rub pigment into the skin. The natural look can be achieved giving the appearance of microblading and even better using the coil machine with needles. In order to do this with the coil machine it takes years to learn and the technician has to have many years of permanent makeup experience using the coil machine which many permanent makeup technicians do not have the skill because they typically use the pen machine which vibrates. Take a look at the "Hairline" brows in my portfolio and you can see how they look like microblading technique but lasts longer and look more like hair. This technique will last for many years. Now to answer your question about removing the microblading work that you do not like, I do not recommend that you use the saline for removal. It is not effective and can cause scarring. Removal should not be done by you but a professional. Most techincians do not even know how to correct bad work and will attempt to cover it with flesh tone. This is a BIG no no! Since corrctive work is our specialty, We get many people from out of state and even out of the country who will fly in after they exhaust all the methods out there. We have done thousands of procedures with great success. Sometimes complete removal is not necessary and we could fix it with better shape or colors but if the entire procedure needs to be removed, we could remove it and let the skin heal and put better brows back. We always draw everything on and select appropriate colors for your new brows. Our "Hairline or Gradient" styles are the most popular that even the most trained tech cannot tell it is permanent makeup. I hope I answered your question and give you enough reason to come visit us. BTW, there is this trend going around called microblading. It looks to me like they renamed the hairline stroke that you have been doing. Lol, you are exactly right! I have been doing this for over 2 decades, but I call it "Hairline Strokes". Microblading is basically another name for what we called 'embroidery technique' with us who have been in this industry before it became maintstream. It is nothing more than using a hand tool instead of machine and cutting skin with a group of needles attached to an exacto knife handle and pigments are pushed into the skin and not implanted like the coil machine. They call it micro-blading but it is still a tattoo and nothing new. It is continuing to be called as such so the watchdogs do not know to monitor the newbies who are in it for the quick bucks. Although it does not last as long as my "Hairline Strokes", it is still a form of tattoo and SHOULD BE REGULATED by the State and the local Health department like tattoo and permanent makeup (geez, skin is cut and blood is involved!). It should be performed by someone who already has permanent makeup experience and many years of experience since it requires a lot of artistry. It is not just simply stenciling in a brow shape and packing in the ink. Unfortunately, fixing microblading work has become our number one business. In a nutshell, my famous "HAIRLINE STROKES" is what "Microblading" imitates. I have so many requests for "microblading" so I do offer it and instead of using my coil machine, I just use a hand tool. It does not heal as quick as the machine method and does not last as long so I do give discounts for the Microbladed brows. My Hairline Strokes brows lasts about 3-5 years and looks exactly like hair. My Microblade brows also look natural, however, it does not last as long(up to a year), hair cannot be layered, and multiple colors cannot be used. Therefore, it will not look as dimensional as the Hairline Stroke brows. Many magazines are quoting the price of the Microblading to be from $700-1500 depending on the city and location of the business. If anyone offers to do it for less than $500 for something as permanent as this, please check their CREDENTIALS, EXPERIENCE, PORTFOLIO, and REFERENCES. This is a must or you will end up paying thousands of dollars to remove them and put them on correctly. Hi, I had my eyebrows done a few months ago somewhere and I really hate it. The technician screwed up and made my eyebrows uneven and the wrong shape. I drew my eyebrows on at home perfectly before getting it done and they were even and perfect... what happened was my line that I drew on my brows came off while she was doing it so I think she just went freestyle. I am fair skinned and blond... I told her to make my brows a dark brown... she made my brows PITCH BLACK! They are still pitch black months later and it looks like I have 2 black marker lines on my forehead. I really regret getting this permanent makeup done... and I don't dare try fixing it. I don't see how pitch black brows can be lightened? I'm trying to get more opinions since you seem to be very experienced... have you had any experience with removing permanent eyebrows with the tattoo removal enzyme? I heard it's supposed to work very well and *without* scarring? I think I want this tattoo removed and I can get a eyebrow hair transplant instead. Do you think if I had my eyebrows removed with it, it would be like I NEVER had the permanent makeup done? My eyebrows are thankfully very thin so there isn't lots of pigment to remove. What's ironic is that I went to 7 different permanent makeup technician consults. I picked who I thought was best and paid $800 for my eyebrows. The technician worked in a hospital inside a plastic surgeons office so she seemed good... I was wrong. I think the issue is some people are more artistic and have a good eye and ability. I obviously did not go to the right person :( Sorry to bother you with another question but do you know if pitch black eyebrows can be lightened? I want it lighter and in a medium brown... not black... can this be done? I don't want to change the color only... I want to make it lighter... the pigment is too dense and harsh.. there's too much heavy pigment if that makes sense to you. I'm thinking maybe it's safer and a better idea for me to just have the entire thing removed with the removal enzyme right now and "maybe" a few years from now I can have the permanent eyebrows redone by someone very good and in a lighter color. Does that sound like a bad idea to you... removing it with the enzyme right now and maybe sometime in the future I can give it one last shot? Just that I overplucked my eyebrows (kicking myself for it) and they are very sparse so I'm forced to pencil them in every morning if I remove it or get an eyebrow transplant. Hi, Sorry to hear that you spent $800 on botched up brows. A technician in a plastic surgeon's office doesn't guarantee great work. A great makeup artist combined with skillful tattoo technique is key. I correct this type of work all the time. I recommend that you lighten up your brows as much as you can and go over with the desired color rather than remove them completely. I also suggest that once you are ready to redo your brows to seek out a technician who not only can implant color but most importantly can artistically implant brows using hairline stroke techniques so you don't get that too dense and harsh look. A good makeup artist is very important and ironically most permanent makeup artists are not good makeup artists. I have heard a permanent instructor tell her student that she didn't need to know how to apply makeup to do permanent makeup. How can anyone trust someone to put something permanently on his or her face if the technician can't even do traditional makeup? Knowing how to implant pigment is one thing, but the technician MUST know how to do traditional makeup as well. Last week, I was at a party, a lady inquired about permanent makeup and asked me how much I charge for brows. I told her my price and a strange looking lady standing next to me jumped in and told the potential client to come to her instead and she can do her brows for $100. I could not believe how rude this strange looking lady was. She said she was a Permanent Makeup instructor and will charge her only $100 to do brows. I couldn't help but laugh and told the potential client, sure if you want your brows to look like hers (blue/black and stenciled looking!) . This is often the problem with inexperienced technicians and give permanent makeup a bad name. I am getting a bit tired of doing corrections on botched up work from other technicians. Permanent makeup is getting very popular and everyone wants to get it done. You have to do some research and look at their work before committing yourself because it is permanent. Many people will look for cheap work and end up with botched up work. The answer to your original question about removal is yes, you can have the permanent makeup removed. If tattoo removal is done correctly, you should not need to have eyebrow hair transplanted or risk having scars. To reduce the risks of scarring, the technician must understand and know how to use the tattoo removal enzyme because the manufacturer's direction for it is very aggressive. Before doing a lip procedure on someone who gets cold sores, do you tell them to take anything like lysine, famvir, or zovirax? A doctor told me that the famvir and zovirax could cause kidney damage and didn't want to prescribe it to my mom before her lip procedure. She may want to see another doctor for a second opinion. If your Mom had cold sores before, she will get them again so he will need to prescribe them to her sooner or later anyway. When doing the mucosal layer is it much different than doing the rest of the eyeliner? Would you use the same #3 needle with the pen? The coil machine ? Yes, the method is very different when working on the mucosal. Mucosal is very tough tissue so you will need to use a coil machine with a number one needle. Use pointilism method for the best results . I have had trouble with traditional eyeliners ever since I began using it but I need it to look awake. I am extremely interested in permanent eyeliners and I was wondering if you could give me any tips. I have pretty deep set eyes so I only need it done on my bottom lids. I am still very cautious as this, if done wrong, could look awful. I would love to know how much you charge for just a bottom lid and what your success rate and the success rate in general is for this procedure. My success rate for this procedure is 100%. Most permanent makeup technicians will have touchups and require more than one visit, but my technique will get the color in the first time. I agree with you, if the procedure is not done correctly, you will have botched up work and have to live with it since it is permanent. I personally do a lot of correction work for those unfortunate ones who have had bad permanent makeup procedures done. If permanent makeup is not performed correctly, the permanent pigment may migrate under the skin causing a smeared look. Improper implantation will give eyeliners the jagged and uneven look. The toughest correction to do is the eyeliner. My prices are not cheap, but you will get the best results for your money and save money in the long run if you have to pay additional fees for correction procedures . My work is so natural that no one will be able to tell that you have permanent makeup on. They will just think you spent hours putting it on daily. My prices vary depending on the type of procedures. I have done thousands of procedures and have not had one unhappy client. In fact, I have also trained hundreds of technicians around the world. You are an ideal candidate for the eyeliner procedure since you are allergic to the traditional make e up. You will actually save a lot of time and money in the long run by getting permanent makeup. Your technician is correct. The fading is only temporary. Do not be alarmed about losing the color because they will slowly come back and the full color will not be in until at least 4-6 weeks. Eyeliners will come in very fast, then the brows, and the lips take the longest for the color to come out fully The brows and lips will look blotchy and uneven for a few weeks. No touchups should be done for at least 6 weeks and you may not need it at all. If your lips feel dry and uncomfortable, use Vaseline SPARINGLY, but do not use Chapstick as it may cause stinging and may exfoliate the lips . These two photos show the size of his tattoos (not to mention his size) that we would like to have removed. We really appreciate your help. Depending on the size of the tattoo, you may need a couple of sessions with me or maybe several treatments with laser treatments (very expensive and painful!). It depends on the type of ink, skin, depth, age, etc. Each tattoo is different. New tattoos often can be removed in one session while older ones may take six or seven sessions. Does your procedure completely remove a tattoo? If not do you know of any? I need help to completely remove my tattoo. Yes, I have completely removed some tattoos on first visits and some required additional visits. It depends on the size, age, and depth. I can remove most tattoos that laser can't w/o the pain associated with laser as well as the high costs of laser. I'm an African American who has really dark under eye spots. Can you help me get rid of them or diminish them with the right shade of foundation and concealer makeup? This really bothers me. As I age, they are more noticeable. Makeup concealer is a quick cover up and there are many choices depending on the type of dark circles, i.e. blue, red, brown, etc... For example, dark circles with blue undertones result from oxygenated blood pooled beneath the under-eye skin. These types of dark circles are best concealed with a pink base concealer. For under-eye spots with red undertones, you would want to use a green base concealer. Brown undertones are more common among Asian and African American skin tones. These may result from hyperpigmentation triggered by eye-rubbing, sun exposure, or genetics. A skin brightener with kojic acid or hydroquinone can lighten these circles when applied daily over a period of four to six weeks. However, if you stop using the skin brighteners, the dark spots will reappear. It is not a permanent solution. Also, you do want to avoid hydroquinone, as it is not safe around the eyes and tend to gray out skin on black skin over the long-term. Unfortunately, it is a hassle to have to cover them up or apply skin brightener on a daily basis. In our office, we do treat these skin problems with laser treatments. The treatment is called Laser Genesis, and involves using 1064 Nd Yag laser to stimulate the skin to produce collagen. This, in turn, builds up and tightens the skin which breaks up the blood pooled under the eyes. It is nonsurgical and requires no downtime. Additional benefits include treating wrinkles and crows feet. Here is some additional information on the Laser Genesis treatment. http://www.permanent-makeup-by-renee.com/services/lasergenesis.html Laser treatments may seem expensive at first but it beats having to cover it up everyday. In addition, the cost of creams and lighteners will add up over the long-term; and the wear and tear on your skin from applying creams can cause premature wrinkles. Should I take medication for fever blisters before I arrive in Dallas for the full lips procedure? Although you should consult your doctor regarding this, my clients say their doctors tell them to take an antiviral for 5 days before the procedure and another 5 days after to avoid fever blisters. I was just wondering if you can give me some tips how I can remove some permanent make up? I was understood that I can use water and salt and that will loosen up the color, but I want to be sure if that will actually do it or if there is another way to do this. I am a permanent make up beginner and I want to learn more on how to do things so if you would please give me some pointers. That was certainly the old fashion method and before better development of new technologies. I have tried the salt method years ago and was not too pleased with the result. There are a few great products on the market that PMU artists can use to remove permanent makeup successfully, however, tattoo removal is not something that a beginner technician should practice without proper training. If done improperly, you may scar your client for life and that is not something that you want to happen. Can you please email me back I would like to cover my tattoos on my hands for a very long time I was thinking maybe this will work before I go and spend money on laser get back to me as soon as possible please. What is the color of your tattoo? If you have any yellow or green, it's very tough to remove with the laser treatment. You will have very good result with laser if the color is black, blue, etc., but that can be very expensive and requires several treatments and sometimes may leave scars. The method I use will usually work after the first couple of treatments and sometimes first visit, but it all depends on the tattoos. I am a 25 yr old guy from NJ and have been searching the internet for a local person to do hairline tattoos. I have a receding hairline and a bald spot, I keep my head shaved so all you can see is the grey outline of my hairline. I've been thinking about getting a fuller hairline tattooed on...Do you know anyone in NYC metro area to help me?? Please give me any info on the subject you can. There are not too many people who do this type of work. I know a few good body tattoo artists in your area, but they don't do this type of work either. Why don't you make a trip here to Dallas, TX. I have quite a few clients from all over the U.S. who have ventured here to get work done by me. The procedure is done by selecting the correct color pigments that match the roots of the surrounding hair area. A light colorwash is then shaded on to the bald spot and a darker color is implanted to simulate the same pattern of hair as the surrounding area. The result immediately after is very dramatic, but will heal very soft and natural looking. This procedure is best done when the bald spot is on top of the head and the bald spot is less than 2 square inch. You also have to realize that if the spot gets bigger, you will have to return for touchup. I believe you inherit baldness genes from your mother's side so check out your maternal Grandfather and see how his baldness pattern was. If he was completely bald at the top at an early age and not just a little bald at the top, then it may not be worth it for you to go through with this procedure. I visited your web page and was very interested in it. Unfortunately I had a bad experience and had permanent eyeliner tattooed on my upper eye lids. Not only is it uneven and discolored it is very embarrassing. I was considering laser removal. Is there something that you can suggest?? Without seeing you, I can't give you the best advice. Laser removal in the eye area is not advisable. I have corrected many botched eyeliners by camouflaging and if the liners are very thick I also lighten it up with a lightener. Can you tell me how permanent makeup specifically works with tattoo removal? I have a tattoo that I want removed permanently. I use the tattoo over method using 2 different acids for removal. It is very effective and better and a whole lot cheaper than laser treatment! I would like to know if you do permanent makeup on legs too. Please clarify. What do you mean permanent makeup on legs? Do you have scars and need camouflaging? If that is what you meant, yes I can do camouflaging on scars, stretchmarks, body tattoos. I have had 10 Microdermabrasion treatments at a salon in my town. They said it is supposed to help clear out some of the scars on my cheeks and forehead. I had those from picking on them..I know its bad..but I just can't stop touching it). I paid $1500 and got 10 treatments done but it doesn't seem to get any better.. the scars are still there..also is the redness around my nose and chin..everyday I still have to put on heavy makeup just to cover those..and now they suggest me to get another 5 treatments called Fotofacial.. and said it gonna help clear out the redness around my nose.. and lighting the scars and freckles a little bit ..with the cost of $2000.. but I found your website on But Viet with all the information about lighting scar and freckles.. that's really interesting..can you please email me back some more info about that..will it clear up my skin at one time?? Or I need more than just one treatment. I'm from Oklahoma. How much would it cost? There are many types of scars; hypotropic (sunken) or hypertropic (raised) scars. It sounds like you got acne scars from doing your own extractions. Unfortunately without analyzing your skin, it wouldn't be possible for me to recommend the best treatment. Some scars can be treated easily and some may require several treatments and different methods. Determining the best treatments (microderm, laser, peels...) depend on your scar type, skin type, ethnicity, etc. It sounds like you got a few problems and not just scars. Redness could be from rosacea, over processing of skin, etc. Be sure that the person giving you these treatments is a licensed medical aesthetician or a doctor who can make correct assessment and evaluation before attempting these treatments. In trying to rectify your scar situation, you may introduce more potential problems. Asian skin tends to hyperpigment, therefore, be extremely careful. The above mentioned procedures are normally done in series and prices vary depending on what treatments will be required for you. I got my eyes and lips done before Christmas for a early Christmas present. I have had them touched up once and my eyes still have a few white spots that I have to fill in and my lips didn't do anything except peel like dry chapped lips. I am going back one more time to see if it will help. I think this is a great idea and some of my friends had it done and it worked for them the first time. What am I doing wrong? I do not put products on to take off makeup just like the lady told me. I am not 100% satisfied and it wasn't cheap. Did your friends get their permanent makeup done by the same technician? If it's the same tech, but other clients are doing well but you then it could be you. Be sure you are not taking any blood thinners (aspirin) anti inflammatories, vitamin, caffeine, etc. on the day of your procedure. Sometimes, eating spicy, salty food, or drinking alcohol can also interfere with healing. After care is important! Stay out of direct shower, sunlight, swimming pool, and don't pick on your scab. Don't put too much ointment on the areas (just sparingly). Please tell me if permanent makeup really IS permanent. I went to a private clinic in Pomona, CA, and had about 7 sessions on my eyes for eyeliner. It was nice and black for about a week; then, it started to disappear within a month or so. I paid for all the sessions but when I complained to the lady all she did was put me in for another session. Just to have the ink disappear completely. I really need eyeliner. I kept going for re-touches every time, until I got tired and gave up. She had no explanation for why it disappeared. Can you please give me some answers? I'd like to have eyeliner [permanent]. If it's tattooed, I assume it should stay tattooed, right? All my body tattoos stay; why did the eyeliner disappear?? Please help. Thank you. Permanent makeup should last for years. I had mine since 1987 and needs some touchup, but it is still very dark. Have you seen her work? Does she have the same problems on other clients? Are you picking at your eyeliners before they heal? I believe the technician you went to may not have the necessary skills and you may not want to go back to her and risk getting scars from too many procedures. She should not charge you each time for a touch up since she never implanted correctly in the first place. PMU procedures can be accomplished on first visits. Sorry you had to go through this seven times. She should take more training before doing this type of work. Technicians like her give permanent makeup a bad name. I have permanent eyebrows that look great for the first few days, then they turn grey. What is my technician doing wrong? We have tried various shades of brown. Please help. How long has it been seen you had your brows done? You will not know the true color for at least 4 weeks after a procedure is done on brows. After 4 weeks, if the color is still grey, there are a few things that could have happened. The tech may not have implanted deep enough, improper after care (use of exfoliants i.e., retin-a, aha, or exposure to sun and swimming pool). Also, what manufacturer of pigments did the tech use? Is the tech experienced enough to do these procedures? Look at her portfolio and testimonials from clients. I have been surfing the web for permanent makeup artists and came across your web site. I am really impressed with your work and wanting to inquire about pricing for corrective work on my eyebrows or even being a model. I would be traveling from Washington State and also wanting to find out if I can complete this procedure in 2 days? Hope to hear from you soon. First of all, what kind of correction do you need? If it's only color correction, it can be done within an hour and you are set to go. If you want complete removal or new shape, it can be from 60 to 90 minutes and can be 1 or more sessions. Prices start from $650 and up depending on what needs to be done. Do you have a close up picture of your brows to show me? Thank you for visiting my website. I can barely see your picture, but from what I can tell you have huge contrasts on your eyepad with darker area near the nasal and whiter towards the ears. The dark area may not be as dark as you think but because of the whiter contrasts, it looks worse. I don't recommend using flesh tone pigments to lighten the dark areas. You may try Microdermabrasion or even eye peels to lighten the dark areas. I think you will get very good results that way rather than camouflage with PMU. Help! I had the permanent lipstick done in November and I have had nothing but swelling and knots (keloids?). I don't know where to turn. The tech that did my lips wants to go over them with a dry needle to allow them to peel again. I am real reluctant to do this. I have taken steroids - the swelling leaves - but then immediately returns. Have you seen this problem before. Any suggestions? I have seen a picture of such before. It sounds like you may be having an allergic reaction to the pigment that was applied. Can you tell me what manufacturer that the pigment came from and what color was used? It is best to go see a dermatologist and have a punch biopsy done to determine if you are allergic to it. If it is an allergic reaction, you may request the dermatologist to administer a Kenalog injection, but do not allow the tech to treat you. I live in Oklahoma and am interested in having my eyebrows done. Do you know of any trained professionals in Oklahoma? They are very thin to not there on the outer edges. Do you have any digital pictures that you could send me to show how natural they will look afterwards? Does it look more natural than eyebrow pencils? Also, can you give me an idea of the price range? Could this be accomplished in one appointment or would follow-up trip to your salon be needed? Thank you for the information. I have a lot of people from OK who come here for permanent makeup. You have to make sure that the technicians are very experienced. I do a lot of correction on botched up work. Your brows are typical for people over 30's. The older we get the thinner our brows become. I can certainly correct them. I specialize in hairline stroke brows to give it a more natural appearance of simulated hair. Prices range from $500-$800 depending on what you want done. The procedure can be done in one visit. Where are you located at? I'm trying to find a permanent make up specialist that's not 1,000 miles away! I'm located in Bradford PA, that's right on the NY border in western PA. I am interested and my niece is also interested in having our eyebrows done. We both got a little carried away with plucking and would like to eliminate that daily ritual! If you are too far away, would you possibly know of anyone within a 150 mile radius of us? If it's travelable by car, we could make arrangements. To fly, would make the endeavor too expensive I'm afraid. Why don't you get a few people together and fly me in to do the procedures. I will travel if there are enough clients. I previously wrote to you months ago about having my full lips done....You answered promptly and I appreciate that....This is the 3rd time I've had my full lip color done.....The first time, the color didn't come in as it was supposed to...( I wanted a dark brownish wine color) so after 6 weeks, my technician re did it again.....results STILL not the color it was supposed to be....in fact this time, I had bluish purplish blotches and streaks appear.....Again, I waited the 6 weeks and we have just tried it again with warm orange color to offset the blue.....Do you have any advice at all? This is really a painful thing for me and I don't think I can do it again.....The tech mentioned, if we have to do it again..etc.....I just about passed out LOL What is going wrong? Please Help! Please find out who the manufacturer of the pigment is, the pigment brand, and the exact color. I will need to know the history of all the colors that was used on your lips. Using orange will warm up the bluish tones, but you have to be careful about re-doing lips so many times because you certainly don't want to end up with keloid scarring from overworking the lips. I wanted to know if it is possible to have permanent eyeliner removed if I am not happy with it? Or at least have it faded more so it isn't so prominent. Could you please answer this question? Thank you very much. Yes, the eyeliner can be lightened. I don't recommend removing it altogether, just lightened or thinned. I have gotten my eyebrows tattooed two times before and both times were a disaster. The first time, I got it done at a small place and when I went in for the consultation we talked about the stencils, colors etc. so we tried several different stencils but they were all so thick. I wanted them thinner so she said ok when you come for your appointment we will draw a shape thinner, the way I like it. Its kind of hard to get them exactly the same especially since I don't have hair on them. So I went for my appointment and we drew a good shape that I was happy with. She began to put on the numbing creme and by the time it was time to start tattooing, the shape had faded away. Well, to make a long story short, they ended up being 2 totally different shapes and one is higher than the other. So I waited a few months and I was so tired of them looking the way they did and became desperate and I let someone else try to reshape them to at least make them look descent. Well, in the end, that didn't work either, so now I'm stuck with these "EYEBROWS" that I can't do any thing with. Then I found your website, it says you can help to correct mistakes (maybe there is hope). I hope you can help me. First of all, the technician didn't know what she was doing because she drew on your brows before numbing you. That is a big waste of time to draw on brows and then numb because the penciled brows would be gone when she clean your brows to tattoo. It would be fine to draw brows on at consultation and a photo should have been taken to ensure that you get the same brows when you returned. When you return for the actual appointment, she should have to numb you first and wait for 15-30 minutes until your brows are numbed, then she should have cleaned your brows completely and disinfect the area, and then draw on your brows with a clean pencil or stencil. Sounds like she didn't even disinfect the area before tattooing and I am surprised you didn't get an infection from the mess of numb cream left on your brows. Fortunately for you, correction is my specialty! I can correct those bad brows. I live near the area and have always wanted to get my brows done permanently. I don't like the hair stroke method but prefer the powdered drawn on look instead. I also like my eyebrows to be thin and dark. 1. I just had a question, I'm VERY picky about my brows and know exactly how I want them drawn in. I want to be able to draw them in at home first the day I'm having the procedure done. This way I know I can draw them in perfectly in my own bathroom where I'm more comfortable. Then I can come in and you can just put the permanent makeup over the exact brow line I drew in at home earlier myself. I've seen a few permanent makeup technicians and they all said this would be ok. But I know if you put the numbing cream on my brows that it will wipe off the line I drew... so a couple technicians said they would do the entire brow procedure without numbing me at all. Would this be possible at your office as well? I mean... it's not really necessary to numb the brows, is it? At least this way the technician can place the permanent makeup exactly over the brow line I drew in at home which is what I really want. And I don't have to worry about the numbing cream wiping my brow line off. 2. And I'm a bit concerned because I've mentioned to all the permanent makeup technicians that I have seen so far that my relative had her brows done and the technician injected the pigment into her brows too deep which caused the pigment to blur and migrate after some time. Is it a huge risk that the pigment will blur or migrate if placed in at the wrong angle or too deep? I mentioned this to the technicians I saw but none were aware of this risk it seemed, which I thought was strange. It would be extremely difficult to tattoo eyebrows without using any topical anesthetics throughout the procedure. I don't think the techs you talked to realized how much bleeding you will have while being tattooed if you don't have something to control the bleeding and pain. Bleeding will be worse when you strain your face fighting the pain. Here is a better way to achieve what you want. You may forego the numbing cream and draw the eyebrows on at home. What I recommend is capturing the outline of the eyebrows first and once the border is tattooed, you must use a topical anesthetic gel that has epinephrine to prevent bleeding and swelling, otherwise the pigments will bleed out when you are being tattooed. Another option is, get the numbing cream from the technician and you can apply it yourself at home before drawing on your brows. Immediately after your brows are drawn come back for the procedure. Of course you have to live close enough so the numbing won't wear off. This is not necessary if the technician knows how to capture your brows first and numb you once the border is captured. You are right to be concerned about pigment migrating and blurring out when a technician implants pigment at the wrong angle or too deep. Pigment will shoot away from the intended area if the needle is not properly angled during implantation. Also, if pigment is implanted too deep it can go into the subcutaneous layer of the skin and cause migration. On the other hand, you may just love the way I draw on your brows. Most people who are really picky usually end up having me draw their brows on after seeing how beautiful their brows look after I have arched them and reshaped them. I have done thousands of procedures and have only had a handful of clients who drew their own brows. They usually change their minds and go with the shape I recommend and call me back to thank me for the difference I have made to their face with their new beautiful brows. I am interested in having permanent eyebrows. How long does it take? How long before it is healed? Is it like getting a tattoo on some other area of the body? It is similar to getting a tattoo except you will be anesthetized locally and permanent pigment will be used instead of body ink. Eyebrows will take approximately 30 minutes and prices vary depending on what you want done. I offer the powdered eyebrows, dimensional eyebrows, hairline enhancement eyebrows. You may call for a consultation to determine what looks best on you. Thank you for the compliments. With such risks we may just want to stick with top eyeliners only. I can also use a coil instead of a rotary machine to cut down on the vibration. Asian eyes can be made to look a bit bigger by lining the eyes very thin from the inner eyes and thicker towards the outer eyes. After courting the idea for awhile, I have decided that I am ready to try some permanent makeup. I had planned to use a lady at a local salon but then started thinking more about how important it is to find "the best" for something like this. I looked thru various web sites and it seems you are probably that person for me. I have trichotillomania. Therefore, I usually don't have eyebrows or eyelashes. I don't think I'm ready to do permanent brows but I am so ready for mucosal eyeliner. Really, I would like to have a consultation with you and see just how brave I am! I also have a small black tattoo that I would love to have removed. It's 7 years old and about the size of a dime. I am nervous and excited about permanent makeup and really hope I can get some help soon! I just did an African-American male client 2 weeks ago who has the same problem as you and worse, alopecia. He went to several people and ended up with me to do his brows. He totally loved them because I did some beautiful hairline stroke brows on him that looked so much like hair! Men brows are not easy to make natural, but I accomplished it. I did full face on several cancer patients who lost all brow hair and lashes and they loved the results so I think you shouldn't be nervous at all. We will put everything on your face like the way you like before anything is implanted permanently. How is it done? do you dip a needle in some ink and stick it in the skin? or is it injected some how? if my face is messed up or I don't like it can I have it corrected? You are so funny. Here are the answers to your questions. You are numbed w/ a topical anesthetics so it's not painful. It's done just like a body tattoo. A machine w/ needles are dipped in pigment an implanted (not inject) into the skin. This may sound like a dumb question, but can we do tattoo removal on black people? Also, I didn't quite understand why you did the glycolic removal + the tattoo removal enzyme. Do you ever just use one of the two? Or always both? It is not necessary to do both, but I like to try different techniques to see what gives me the best results. After a while removal enzyme tends to dry up and clog my machine so I use glycolic to lubricate my needles. The removal enzyme can be done on African/American people, but you have to be careful not to overwork as dark skin tends to keloid more. I always discourage my clients from having lip liner that is distinctly darker than the full lips. If lip liner is done correctly it will have a nice liner effect that blends in without the ring around the lips. Makeup artists spend a lot of time blending in the lip liner to match the lipstick color so I don't understand why a PMU technician would purposely put 2 different colors permanently on a client without explaining the stark differences of having a darker liner since permanent liner does not blend like everyday lip liner. It is unfortunate that you went the laser route to remove the liner. The pigment which was used on your lips had iron oxide and the laser turned it to that "gray/blue/black/purpleish color" . I think the best approach now is to go to a reputable technician who specializes in color correction and have your lips re-done again. Using the correct color can tone down the "gray/blue/black/purpleish color" from your lips. Good luck. I was wondering if you have performed, or even heard, of an acne scar remodeling procedure that requires the use of the rotary hand tool? It is, essentially, performing a non-pigment tattoo on the affected area to, in effect, damage the skin to promote collagen growth. I learned of this technique on an internet message board and was looking for someone in the D.F.W. area to treat me. Thank you. Yes, it is a dry needling method used to retexturize scars. I have used this method mostly on lips and on some hypertrophic scars, but found microdermabrasion using sodium bicarbonate to work best on acne and hypotrophic scars. I got my eyebrows done and the tech messed up. It is uneven, different shape, long and thick. I want to remove it. Does it leave a scar or any white spot behind? Does the removal procedure make my eyebrow hairs fall out? After the removal procedure, will my eyebrows look normal and natural again like I had never had it tattooed or do I have to draw it in to hide the reddish or brownish scar that is left behind. If I want to have it corrected, will it turn out the way I want w/out scarring. I want my eyebrows to look natural. Can you fix it like that? I saw the picture where you corrected eyebrows for a client and right afterwards it is red like a burn. Does the redness stay long? Also, after it heals the correction is nice but I can tell that there is a white lining around the corrected area. Is that permanent and normal? I'm in Houston. Is your place in Houston as well? Thank you so much and your site is really helpful. The removal of eyebrows can be done successfully depending on how deep and dark your permanent brows are. My method will allow your brow hairs to grow back as before. The pinkish tone will diminish overtime, therefore, you should be fine. The client you saw on the internet came back a week later and her brows were not completely healed so that is why you can see some dry skin flaking around the brows. I will post new pictures of her soon so you can determine how amazing she looks healed. I am located in Dallas, but do have clients that come in from Houston all the time. I was told by a friend that when doing permanent makeup you should make sure that the ink that is used is not Chinese ink. She said that Chinese ink turns green after a while. Is this true? I am interested in doing a full face but I am worried about the eyebrows. My goal is just to define the shape and make it look natural, but better. Thank you for your time. The type of ink your friend mentioned is usually made for body tattoos and not for the face. Over time, depending on the ink used, it may fade to bluish gray, green, pink, or purple. I have done many corrections on clients with this problem who had procedures done elsewhere. With a little bit of color theory, it is not a difficult problem to fix. It is important that technicians do not put body pigments into the face and that they must use quality pigments. I had a full lip color done 3 weeks ago. After the initial flaking, I noticed a dark line of color on my upper lip following the outline of my lips and about 1/4" to the inside of my natural lip line. I have been nervous about this and went to see the person who did the lips about it a few days ago. She says she has never seen this before and to wait 6 weeks to see if it goes away. She acts as if she has no idea what could possibly be wrong. Do you have any clues as to what has happened? I have been trying to do my own research on the Internet without much luck. Thank you for your help. The answer to your question depends on many factors. What is your nationality? What was the color used on your lips and what brand? Have you had laser treatment done after your procedure? These are just some of the factors that could affect the outcome of your Full Lip Procedure. If you could give me some more details, I may be able to pinpoint where the problem lies. I have a question about permanent eyeliner. I just had this done and have since gone for the retouch. The first time it all went away. This time it is starting to go away and it has been 6 days since the touch up. I thought it would last and look like I wanted it to? Any suggestions? She was recommended by 2 doctors and has been doing this for 12 years. It was costly and I am not picky but would like to look like I am wearing eyeliner after this. Please help - I need some sound advice. I have done everything on the aftercare sheet. She says to use castor oil for 9 days after. No make-up or cleansers on the area. I haven't even taken a shower - stuck to baths. Just can't understand what the problem is. Thanks for any help you can give. Recommendations from doctors are great, but not enough. You need to also look at the technician's work. I had a client who asked for a half dozen client names for references and she called each one and actually went to see them. All this after viewing my portfolio and reading client testimonials. So she really did her homework before trusting her face to me. Her concern was that she has only one face and she had to find the best. Many technicians have problems with eyeliners due to improper technique; such as improper stretching, insufficient angle or depth, etc. A skillful technician should be able to get your eyeliners in the first time. I am not saying that your technician is lying to you about her years of experience, but I believe that the aftercare instructions she gave you may contribute to the fading of your permanent eyeliners. People have been using castor oil for many remedies. It is known to have amazing healing powers. There are many uses for this "old folk remedy", but I would NOT use it for aftercare for permanent makeup. Anything oily will draw the color out. It is important to keep your fresh permanent makeup from contact with anything oily. Here is how you should take care of your eyeliner. First, do not use oily makeup remover or baby oil, mineral oil or heavy creams. Especially glycolic. I like Almay non oily makeup remover pads, Cetaphil or Ponds non oily formula. Second, eyelash tinting or eyelash perming must be done 72 hours prior to procedure and may be done 2 weeks following the procedure. Third, DO NOT RUB, SCRATCH OR PICK AT YOU EYES! Let any residual pigment come off naturally. Lastly, for after care, use Neosporin cream for 3-5 days only in the eye area indirectly around the eyeliner and let heat draw the cream in. A small amount twice a day to keep moist is all that is needed. Can you tell me the cost for doing lip liner? And how long have you been doing permanent make-up? Lip liner is $700. I have been doing it since 1987 and I am also an IDC instructor to hundreds of students nationally and internationally including doctors and nurses. It all depends on what you want, but you can go with the powder look, hairline, or dimensional. There is no healing downtime and it takes 30 minutes to numb topically and 30 minutes for the actual implantation of color. The procedure will look dark at first but flakes off gently towards the 3rd day and may look blotchy for the first couple of weeks. Towards the 3rd and 4th weeks all the color will return. Expect the color to fade about 10-20% for brows to a very natural look. My price is $500 for the powdered look and $700 for hairline strokes eyebrows. Could you tell me the difference between powder look, dimensional and hairline? Also could you give me the cost for those procedures? The Powder Look is what you see on people when they put powder on the brows to darken their brows. It looks great if you already have a lot of hair on the brows. If you are losing eyebrow hair and need to have a more realistic look with hair, the Hairline Strokes is best. If you do not want hair look, but a more believable eyebrows with dimensions (blended 3-5 colors) to match hair and highlights, then the Dimensional Look is appropriate. The Powder Look costs $500 and the Hairline Strokes or Dimensional Look is an additional $200. I developed the Hairline Strokes and Dimensional Look techniques and have taught many others my techniques, but barely a handful can imitate it since it requires a person with natural artistic talent to achieve it. It is best that you come in for a consultation to determine what looks good on you. I am very interested in the permanent cosmetics theory but I am very nervous about having someone tattoo permanently on my face. I do my eyebrows every week and they tend to last most of the week but I can't swim and I play a ton of competitive volleyball and I sweat like a pig and tend to sweat off my eyebrows. I'm very paranoid about them being wiped off or someone touching my face. I don't have eyebrows since it's the way I was born. I have tried to draw my eyebrows in. I'm an artist by nature but I am very very particular about my eyebrows...I want them to look as natural as possible and I would like to get them permanently drawn on but I'm a bit scared. Can you tell me what you trace over? Do I have to trust that someone will have a good hand and draw from a picture or do I get to draw them first and then they are traced by the technician?? I'm not sure on that process. How long is the healing process?? How long does the procedure take?? How painful is it??? Just a few questions I would love to have you answer if you could. I have planned on getting this done in the next month...so I'd appreciate any help in soothing my nervousness. Also do you have consultations with your clients first?? I anxiously await your answers to my ton of questions! You sound like a perfect candidate for permanent eyebrows. I usually study the morphology of the client's face and draw on eyebrows that enhances the feature of the person's face. If your face is round I tend to angle the brows a bit to give more length to the face or if your face is square I tend to round out the brows a bit to soften the angular feature, etc... However, if you are particular with how you want your brows, I would allow you to draw them on and I would perform the procedure exactly as it was drawn by you. I am also an artist, therefore, I understand that knowing how to tattoo is only half way there. I numb the area with topical anesthetics, therefore, you will not feel any pain. The actual procedure takes about 30 minutes and you look pretty good afterwards without any down time. The area may look dark for a couple of days, but will gently flake off like a natural sunburn. Towards the end of the week the area will look slightly faded, but the color will return to a beautiful natural color about 3rd to 4th week. Most people who come into my office for corrections do look very unnatural, but I can assure you that my procedures are so natural and realistic that no one can tell you have permanent makeup on. I specialize in Hairline Strokes for eyebrows and they look very realistic. I just had permanent eyeliner done a few days ago and am not happy with the results. The lines are too thin and uneven on one eye. The tech that did this told me to give it at least 4 weeks for a touch up, but am a bit afraid of what might happen next. I was wondering if it was really necessary for me to wait the full 4 weeks to make any corrections. Along with each eye being uneven, on one eye she went up into my eye lid at the very end of her line. Can this be removed??? I live in AZ. How far are you from the airport in Dallas? I would be willing to travel there to have this corrected ASAP. Yes, you should wait for about 4 weeks for your permanent liners to heal completely before getting a touchup. Any touchup done before the skin is healed may result in scarring. However, if she made a mistake during the procedure and went too far up it should be removed immediately within 24 hours otherwise you will have a hard time removing it later. There are so many people trying to get into this business and not having enough training. I hope this tech will go back and get additional training before attempting another eyeliner. Eyeliners are the easiest procedures to do and if one can't master that one should search for more training. I am located about 20 minutes from the Dallas-Fort Worth airport. I had a bad job of permanent eyebrow makeup applied because I was tired of trying to grow my own eyebrows back in, big mistake. I want to know if the permanent make-up can be removed and the approximate cost? I hope that you can help, it sounds like your center is very advanced in this industry. Yes, you can have the eyebrows removed or corrected. The costs depend on the number of sessions needed for the removal. The average cost is $600-$1,200 and is still much less expensive than laser which can be $3-5K. My method of removal will also not alter the texture of the skin like laser. I desperately need my eyebrows to be corrected. I had them done in only one session and paid $700 for them but unfortunately the technician wasn't as skilled as I thought she was and really messed up. I've noticed that there are many technicians out there but most don't have that artistic ability to do a good job. $700 is quite high for a set of botched up eyebrows. However, your dark pigment can be easily removed with a tattoo removal enzyme and your eyebrows can be easily fixed. This type of correction is routine for me. Can my current brow pigment really be removed with the tattoo removal enzyme and re-done? I really really hope so. Then I'll be very happy... but can my brows really be removed safely with the enzyme and re-done? Are there any downsides to having them removed with this method and then having my brows re-done later? I know 100% that the majority of pigment will need to be removed in order to fix them the way I want them to look. But I hope the enzyme won't cause a lot of scar tissue and then it will be more difficult to re-apply the new pigment or anything like that? I know I'll love my brows once they're fixed. Right now the number one reason I hate my brows is because they are slightly the wrong shape and very uneven. Hoping what I want done can be done :) Thanks for your time and opinion. The tattoo removal enzyme won't cause any scarring if done properly by well trained technicians. New brows may be applied after 1-3 removal treatments. I will be happy to send you pictures of before and after of happy clients after eyebrow corrections. I can also provide you with phone numbers of those clients so they can tell you about their experience. Enzyme tattoo removal is very safe and effective. All my clients are very happy with the results. They especially love the new beautiful brow shapes I give them. The removal enzyme is great, but I have seen very bad results from heavy handed technicians. One of my clients came in from out of town with very bad scarring and her removal procedure was done by a doctor. Just be careful and check out the technician's work first. I had my lips permanently lined three weeks ago. I chose a soft mauve color that looked like just a slightly darker color than my natural lips. The person doing this numbed my lip area and I drew my lip liner on myself like I usually wear it. She lined the bottom lip in just a few minutes, but when she started the top at the corner of my mouth and got just a little bit up, she said I was bleeding and she wiped the area and applied more topical anesthetic. She continued to work on me, then said I was beginning to swell. After she finished I was blown away! I looked in the mirror and it appeared to me the top liner was much too high! Maybe 1/8" above my normal line. I mentioned it and she said it would look great, that I was just swollen. It would go down. I kept ice on it all the way home on and off for 1 1/2 hrs. It has been one week today and I can see it is definitely too high. The bottom doesn't look like it even took, but the top lip is above my natural line and even showing a white streak above my natural liner. She put the top line a lot heaver than the bottom and it took a lot longer to finish. I have called her back and she says she is sorry, she lost my liner that I did when she had to re-deaden the area and wipe off the blood. But now I have a top liner that looks like a brown mustache. After she did the right side, she must have had to match it to the left side. I can't line with my normal red pencil, because it has to be applied too high and looks terrible! All I want at this point is a total removal of this liner and get back my natual color skin.......Is there any hope without scaring? Please help! She says she can't do anything for six weeks and is mentioning some kind of orange agent to apply and re-line with a more red rather than brown tone liner. I really don't want any more line applied. Thanks for any help in this matter. Oh, I didn't mention that the color is looking more like a bloodshot area rather than a line. It looks like I have drank chocolate milk and it is still on my upper lip! The color is more brown than mauve. I met a lady recently who had permanent makeup - she had it all. I am initially interested in my eyebrows - I have plucked most of them away over the years and must draw them on each morning - it is time consuming and frustrating. Would you please send me some information on all of your procedures and your prices. Also, do you know anything about eye brow hair transplants? Thanks for your time! Prices range from $500 and up depending on the procedure. The best suggestion I can give is to come in for a consultation and we can determine what you want done and what your budget is. The more you do the better the prices. I don't know anything about hair transplant for brows and don't even know if such a procedure exists. I would imagine it would be very difficult to implant brow hair and make the hair grow in the same grain as the rest of the brows. My procedure involves simulating brow hair by implanting pigments to the eyebrow area to make it look like hair. You can look at the African-American client picture on my website and see how realistic the hair on his brows look, however, the client is completely hairless all over due to a condition call alopecia. The procedure is simple, quick and is permanent. I had my lips done yesterday and I hate the color. It's too bright! I was told the color would fade 60%. Is this correct and how soon will this happen. Is there a way to soften the color? Is there a way to take back yesterday? Yes, the color will fade a lot. Depending on the color used and how the pigment is implanted. It may fade from 30-50%. If you don't want any color at all then have it removed ASAP. If you wait for 4 weeks it will be harder to remove, but by then you may like the way it looks. If I were you, just wait and see how the color turns out before you remove the color needlessly. It should heal nice and natural if done properly. I have a pigmented scar on my upper lip caused from hyperpigmentation. I have had chemical peels, laser, and lightening creams. I still have not corrected my problem. Is using ink a means I should consider or should I stay away from it.... desperate to know. There is an enzyme method as opposed to micropigmentation that I use for correcting hyperpigmentation. This means I will be taking out pigment rather than putting more in. I would have to see you in person to determine the best method. What is the difference between mucousal and permanent eyeliner? Also what is the cost of the procedure? I have priced around my local area and am curious in an area where I also have family. Mucousal is an eyeliner procedure done in the wetline area inside your lashes and permanent eyeliner is a procedure done outside the lashes. Prices in the Dallas area for an eyeliner procedure can range from $250-$1000. You can probably get eyeliner done for as little as $50 at someone's home or nail salon, but you risk getting botched up work, or worse, infections or diseases. I charge $400 per procedure for a standard top eyeliner . Just calling around to get pricing is the worst thing that you can do. Check out the technician's work and pay for quality work. I do more corrections on botched up work than you can imagine. It is very important to check out the facility, qualifications, portfolio, experience of the technician rather than shop around just based on prices. You only have one face to live with so trust your face only to the best. Don't try to save a few dollars and end up spending thousands to fix bad work. When you go to a hair salon to get your hair done, you will know that experienced hair stylists will charge more than the average hair stylists. Fortunately, a bad hair color or cut can be easily fixed. A botched up permanent makeup is much tougher and very expensive. 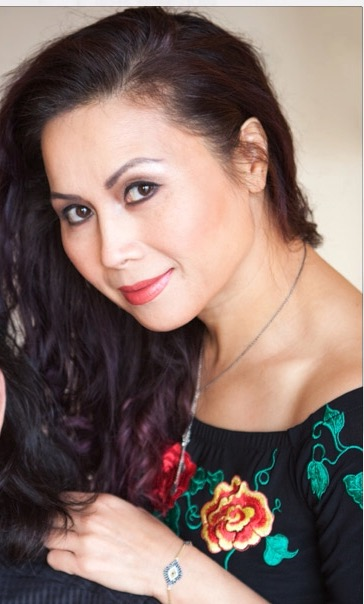 Hello...I just recently moved back to the area from Hawaii and wanted to get involved with permanent cosmetics. I was very impressed with your credentials. Do you teach or could you introduce a good school. Thank you. Thanks for your compliments. Yes, we have several excellent programs. The 3 day comprehensive program will be the most solid program for beginners. However, if money and time is a problem, we also have 2 day courses which will allow you to learn at your own pace, budget, and time. Our students love the flexibility of our programs that we offer since they can better budget for a very high revenue career with very low overhead costs. Our students are very well trained and have become very successful. Not a single student graduates without performing several successful procedures on real clients. After graduation, my students have access to me 24 hours a day for any technical support without having to purchase any kind of memberships. Please check our website for more info. Click HERE for the schedule. Could you tell me what kind of facial cleansers I can use on my face and eyes that won't harm my permanent eyeliner? Also, what kind of eye makeup remover can I use? Some say anything oily is bad. Some say any kind of glycol is bad. Some say anything with alcohol or acids is bad. Everything has these items in them. I'm so confused. Can you help me? PART 2: Thank you for your prompt response. The reason I was asking is that when I had permanent makeup in Oct., I had a full face done. Then I had my touchup in Nov. One more in Dec. finally got brows and eyeliner right but my lips aren't as dark as I'd like. So I chose to go back in the next month to have them done again. But for some reason my Black eyeliner is turning a grayish color. For a while I was thinking it was my eye shadow that was covering it so I used a real gentle eye makeup remover by Lancome to go over the liner to get the shadow off and I thought that might be stripping the color out. But I am being told that since I have an olive complexion sometimes it's harder to get the colors right because I have a lot of blue tones. I know that my technician used Premier ink on me. I hate to ramble on but I am just kind of frustrated. Any suggestions? You shouldn't have to worry too much about what cleansers are safe for permanent cosmetics if your permanent makeup is more than 4 weeks old. Your skin is going to peel on it's own anyway. Therefore, whatever cleansers you use won't make that much of a difference once your permanent makeup has healed (4 weeks after your procedures). Products with exfoliating agents may speed up the fading process, but not enough that you should have to worry. I have permanent makeup in addition to monthly microdermabrasion and chemical peels. I also use AHA on a daily basis and my permanent makeup still looks good. Your brows may fade more in the sun if not protected by sunscreen. In general, don't worry too much about it. You may need a touchup in 2-6 years anyway to freshen up the colors, but you can't stop your skin regimen because you worry about your permanent makeup fading. It doesn't fade that easily so just enjoy and use what works on your face. PART 2: It is not possible to clean off permanent makeup with cleansers so you can definitely rule that one out. I have worked on many clients with olive skin and do not have that same problem. As you may have guessed, it may be the pigment used. I have worked with that brand of pigment that you mentioned in the past, but have switched two years ago due to similar problems and do not have that problem anymore. I can't mention what pigment I am using since I do not want anyone to think that I am promoting or discrediting any brand of pigments. You may do your own research to find any information or warnings on that particular brand. I really love your portfolio. I have been doing a lot of research on the web and noticed everyone is using the same photos that I have seen on permanent makeup brochures. I am glad that you are able to show real photos of your actual work rather than use standard brochure pictures. I am glad you noticed. My pictures are not only my own work but the pictures are untouched and photographed immediately after the procedures and 4-6 weeks after healed. The clients are immediately photographed within minutes of completion and you can see no bruising, swelling, and bleeding, etc... I can honestly say what you see is what you get and the pictures are mine and not touched up in anyway. Thanks! I have read your testimonials with interest due to my unhappiness with the "purpleness" of my lips. They were supposed to be "antique rose", by Premier. Also my eyebrows were colored "Champagne Blond", but look more auburn. Not only did the colors not turn out, they don't match! The eyebrows I could live with but I really want my lips to be a different color. Help! Thank You! Many people have contacted me regarding the same problems that you have. The good news is that I can easily correct that. I was relieved when I saw your website. I had full permanent lips done in November. I was supposed to go back in January for a touch-up. The Spa closed down and I had no way to contact the technician who did my lips. I could not find anyone to do the touchup since I could not tell them what color was used. Another Technician suggested I contact Premier in Arlington,TX. I explained my situation and they had a Master Tech do my lips for a fee. This was 3 weeks ago and I have called the school twice to try to get the Tech to return my phone calls. She has never called me back. I know she used Rosewood with some orange drops mixed in by Premier. She went over my natural lip line to give fullness. It looked good when it was first done. Now I look like I have a mustache. The lipliner color looks brown on parts of my top lip. Where the color has softened it does not look too bad. Between my lipliner and my top lip there are areas that are white and some are a lighter pink than the actual color on my lip. My husband thinks I look awful. I try to cover it up with makeup, but when it fades you can see the color differences above the top part of my natural lip. Is this something you could fix? I know the Master Tech that did this said I would need a touchup and it would take about 6 weeks to see the full results. I do not want to go back to her. I live in Arlington,Texas. It looks like she went about 3 cm over my top lip line. Also, could you please give me a ballpark of what this would cost? I look forward to hearing back from you. Sounds like you got botched up lips. The technician has gone beyond your vermillion border. I've seen that done a lot when they work on lips that swell during the procedure and didn't capture the liners first. As for the different colors on your lips, Premier colors are very thick and need to be mixed constantly during the procedures. The tech didn't mix the color well, therefore, the color got implanted unevenly. You may contact me directly for a consultation and we can determine what can be done. Take care. Bruising from eyeliner. I had permanent eyeliner applied to my lower & upper eyelids 3 days ago. One of my eyes has bruised badly looking as if someone has punched me. The technician told me that I squinted too tightly during the procedure or maybe when she gave me the needles to numb the areas. I'm not sure exactly when she thought it happened as she doesn't speak English very well. Any swelling has gone away, but the bruising still remains way above the liner on my upper lid & way below the liner on my lower lid. Most of the bruising is a dark purple & red. To be honest with you, I can't tell if it is subsiding. I am very fair skinned so think it may take more time to notice any healing. I also think that the bruising only peaked to its worst yesterday & am hoping that it is on a path to healing now. Have you ever seen this? How long do you think it will take to heal given my skin color? Have you ever heard of such bruising not going away? I've never had a black eye! I have no knowledge of the healing process & duration. I expected to see more progress by now though. Please let me know what you think. Thanks. I don't know if I would trust my face to someone who specializes in nails and a dermatologist may not necessarily be good either. Go to someone who specializes in permanent makeup only. However, if the place is sanitary and they follow strict OSHA standards, has a good portfolio, testimonials, many happy clients with good results then I would do it. Those manicurists may have their lips done by someone else and not them. Ask them for references and go check out their clients. Sorry, I don't know of anyone in your area that are good enough to send you to. Good luck. I recently had my brows done & was completely satisfied. However, it didn't last. It seemed my right eyebrow corner disappeared & the left eyebrow tail disappeared. I wonder if you could explain how to care for them. I didn't rub them, or pick them, I tried not to wash them (unless I had ointment on them overnight (A&D ointment given at time of procedure). Anyway, I went back & she re-did both corners of brow & tails. They're fine now. It probably was not implanted properly since it sounds like you took care of them properly. About four months ago I had lower eyeliner permanent makeup put on. It is a terrible job!!! It is very thick and uneven. I have spoke to several surgeons and they say that I can not have it removed because it is on the eye. Is this true? Can you help me please? It would not be safe to remove, but can be safely lightened and evened out. I had eyebrows done 4 weeks ago for the first time. They scabbed by the next day, and then began to crack and flake off. Unfortunately, with the flaking and peeling, came the color as well. The pigment didn't take for some reason. I had my touch up done 4 days ago, and she added different color (wasn't happy with the first--too ashy) and filled in areas that color came off. By the next day, I began scabbing again, and by yesterday, scabs were very thick on the ends of my brows (temple sides) but are thin scabs and light flaking/peeling on inner brow. The scabs began coming off in chunks today, and again, with it came color. I am so frustrated, and don't want to go through this again. Could you tell me what could possibly be making my eyebrows unsuccessful? I also had eyeliner put on, and noticed a small space on my lower lashline has disappeared. I'm just curious about why my skin is not holding the dye!?! Please write back ASAP, so I can know what is going on and NOT spend more money if this will continue happening to me. Thank you! It's not your skin and don't let her blame it on your skin. The technician is too heavy handed. She went too deep causing you to scab up and taking the color with it. Don't let her touch you again or you might end up with permanent scars. Find a better and more experienced technician with proven record. Good luck. How do lash enhancements differ from lash extensions? And which do clients typically like better? Lash enhancements are permanent and last for years. They are done between the lashes to make lashes look thicker. 3D lashes (false lashes) are lash extensions and lasts for up to 2 months depending on the life cycle of your natural lashes. My clients usually do both. They do the lash enhancements first which is permanent (similar to eyeliners) then return 4 weeks later and have lash extensions put on. This combination gives them the vavoom eyes. I have heard about needle dermabrasion being performed for indented/acne scarring. Do you have much experience with this and what were the results. I would definitely be interested in getting this performed from the success stories I have read about. I have very good results with the skin needling method. As a matter of fact, I treat many scars associated with acne, facelifts, tummy tucks, and also severe burns. I have even treated wrinkles using this technique. My method is very simple but a person must be very knowledgeble about the science of skin and more importantly seasoned at the art of micropigmentation to be able to achieve great results. There are many types of scars, therefore, understanding the type of scar, a person's ethnicity, and the specific type of technique to use is critical. It was pleasant speaking to you on the phone. As a Medical Esthetician, I treat many acne cases. My experience with treating scars and wrinkles (surgery related scars and acne scars) happened by accident. About 10 years ago, a young man came to me to have his home made tattoo removed. The tattoo was very keloided and about a 1/4 inch raised. Weeks later, he told me his scar had nearly disappeared and the areas where the scars formed no longer itch. Not long after that, I had an Asian lady come in with bluish/gray brows asking me to remove the terrible brows. I found out the lady had a brow lift and permanent brows were implanted immediately after the surgery. I was shocked that a surgeon would suture up a brow lift and perform permanent makeup on the same day before the skin even had a chance to heal. Needless to say, she was very scarred where the lifts were done. I removed her tattooed brows and checked up on her a month later. She told me that her scar was no longer visible and that she no longer had to grow bangs to hide her scarred up brows. She told me she was more happy to see that the scar disappeared than her original intention of fixing her permanent makeup. She also found that her forehead seemed tighter like she had botox. I figured I was onto something. At that time, I thought that maybe the needling process broke up the scars and promoted collagen production and allowed the skin to heal evenly. So ever since then, I have been using the same needling method using seasalt and distilled water on hypertrophic and hypotrophic scars with very successful results. I also found that many of my clients who had permanent lips and brows done experienced a facelift-like appearance. Many smokers with wrinkles around their lips who had permanent lips done also found that those wrinkles disappeared and their lips were plumped up as if they were injected with collagen. So I have used needling ever since for scars and wrinkles. Anyway, I hope I can be of service to you and anyone who is in need for my specialty. Your basic understanding of the "skin needling" process is correct, but I discourage anyone from just attempting to perform these procedures on themselves without the proper training since they could scar themselves even more if done improperly. As a caution, the information available on my website is information only and many details are not mentioned since many variables come into play such as the type of scar and a person's ethnicity. How long do lash extensions last and how do I take care of them? Lash extensions, or 3d Lashes, will last up to two months depending on the lifecycle of your natural lashes. This lifecycle can be from two to three months. Lashes don't fall out all at once but one or two may fall out every couple of days. So eventually, touchups will be required to maintain that full and luscious look. Those who want a full look all the time like to come in every two weeks for a touchup. Maintenance of the lash extensions are straight-forward. Stay away from oil-based cleansers, make-up removers, and lotions; and avoid rubbing your eyes when cleaning them. Eyelash curlers and mascara is not necessary since the lash extensions already have a natural curve to them and the thickness of the lash extensions can be selected by you. I had full lip color done on my lips and just had a touch up done. I was wondering how soon I can use sunscreen lip balm and resume my outdoor activities. Also, what ingredients should I look for and AVOID when choosing a sunscreen balm? Thanks so much! I would use antiobiotic ointment for 3-5 days and then continue with your sunscreen lip balm afterwards. Avoid lip balm that has any exfoliating ingredients. Anything minty and also lip plumping ingredients should be avoided until at least 4 weeks after lips procedure. Can you tell me how eyelash enhancements are done? Also, I've been having last extensions done and am not real happy with the outcome. If I came to you would you have to start all over? If so what would the charge be and what do you charge for refill. Thanks so much!! Lash enhancements are done with micropigmentation(permanent makeup) and lasts up to 10 years or more. Lash extensions are semi-permanent and lasts up to 2 months. My extensions are done with single lash and not clusters like others. If you had it done in clusters, you will need to have them removed first since they are not extensions and do not last as long. Lash extensions touch up can be done every 2-3 weeks starting at $75. I want permanent lip color and I was curious about the cost. I want it for my birthday but I need to know ahead of time, before a consultation. I want the full color, and like I've read on this website, I want mine to look like a natural shade, like pink. My upper lip has a discoloration, its not too bad but I've hated it. I was also wondering if it really does make your lips bigger too. I've heard that before, but I wasn't sure if it was true. I live in Plano so this is not too far from me. So if you could email me the price of a full lip color (no lip liner), and if you may answer my question, I would be so grateful. I hopefully will be seeing you soon. Thank you. I can give you the exact look you desire. Yes, fuller lips can be achieved. Natural collagen is stimulated in your lips during the procedure giving the appearance of much fuller lips. Some of my clients also experience less wrinkles around the lips. The cost of full lips is $750 (no liner). Thanks. Can you Microblade over Ombre brows? Yes, you can Microblade over Ombre brows. However, it does depend upon the color of the brows. When it comes to working over an existing procedure, it is always best to come in for a consultation so that I can see what you have and then give you your best options for your desired look. I had my eyebrows done Aug. 9th, the left eyebrow turned out ok, but the right eyebrow you could see the lines where she drew on the stencil. I had them touched up on Sept.9th and now the left eyebrow color is not there and you can still see a little bit of the of lines on the right brow. What can she do to correct this problem or should I go somewhere else? If the brows are still not right after the second time, the third time is not going to be any better. You may want to go somewhere else before it gets worse. Good luck. I got the natural lash extensions done by someone in Dallas, but they only stayed on for a couple of weeks and were very expensive to last for such a short time. Do yours stay on longer and how much do you charge? Mine will last for up to 2 months and sometimes longer with touchups. Mine start at $150 for regular length and fullness and may be higher for longer and thicker lashes. I was wondering when the deposit is put down and I have the consultation and I feel that the services aren't for me, do I get my deposit back or how does that work? I also wanted to know if you do several procedures at one time? I usually refund my client if they change their mind about a service. Depending on what services the client wants, I can perform multiple procedures on the clients at one time. If a client wants permanent eyebrows, eyeliners & lips, all can be done on the same day. However, if a client wants lash extensions and permanent eyeliners then they have to be done on separate days. I read through your site and was really impressed with how thoroughly you answer the questions submitted. I was considering being a model at an instruction clinic, but your information is giving me second thoughts. My question regards post-permanent make up and plastic surgery procedures. If I have lip liner & full lips done, would future plastic surgery to my chin or neck distort the results? Thanks so much for your time; I realize it is very valuable. Good idea. You only have one face so don't take a chance. I also instruct and my models are always beautifully done since I supervise very closely and begin the work and finish the work myself. The answer to your question is "no". Future plastic surgery to your chin or neck will not distort your lip liner & full lips. I am a natural blonde with thin and sparse brows near the tail. I had permanent makeup placed 2 days ago and I hate it - of course it is not healed - the color applied was light (Although it looks way too dark right now)- Light champagne was the neutral light color for blondes. I am absolutely regretting doing this and should have done more research prior. I think that the shape is good and it is within my natural brow line with the exception that one arch was slightly lifted and the tail really has no hair on it as of now. If I give it some time to heal - what is the earliest that I can have it removed? Is there anything that I can do now to lighten the pigment? My husband is so upset that I did this. My stomach is in knots to the point that I am irritable because of what I have done and have no appetite - chalk it up to stupidity. Any advice would be appreciated ASAP. I feel like I am in dire straits with brows that I may regret. Please help! Again anything that I can do now to lighten the pigment before it starts to crust. Tomorrow -Wednesday will be day 3 post procedure. Are my feelings normal - my tech claims that this is so. She is willing to fix them if need be, but I'm not confident with her experience on removal. Again Thank you - I am just feeling totally depressed over this whole thing. I want my natural brows back or at least a very light pigment. Please help! The champagne color is one color that will turn gray. I am not sure if this manufacturer has fixed this problem. I no longer use this color or any color from this manufacturer, but am aware that it was a problem a few years ago. If you are thinking about having it removed then don't wait for it to heal. Once it heals, it will be harder to remove. Do it ASAP. Make sure the tech knows how to remove it or you may risk scarring. You are very close to me, so feel free to call me and come in for me to check it out. I was looking for a permanent makeup artist to do my eyebrows for me. I am very picky with my eyebrows and always draw them everyday and have been scared to have anyone permanently do them! I've seen so many botched eyebrow jobs! After looking at your site, you seem very dedicated to your work and professional. I have a couple questions. First off, do I need an appointment for you to do my eyebrows or are walk-ins available as well? I am Asian (Vietnamese) with light to fair colored skin and I think I will also need your help to pick out the color that is not too dark and not too light and the best technique. Also, how much do you charge for eyebrows? I have some tattoos that I wanted to remove also. I would only want to remove them if they will REALLY go away with no markings of them left behind, in other words I want it to look like as if I never had the tattoos. Is that possible? If so, please give me an approximate pricing for that as well. I am a cosmetologist! And I am also interested in doing what you are doing and wanted to know more details about your training program. Hope to hear from you soon! Thank you! Unfortunately, my schedule is so booked up that I cannot take walk-ins. It's best that you schedule an appointment for a consultation first to determine color, shape, etc. I am often booked from one to two months out so please call me directly to schedule an appointment. I charge $500 for the standard powdered brows. I am very familiar with different ethnic skin types, therefore, rest assured, you will get the best color for your ethnic skin. As far as tattoo removal, once a skin has been tattooed the texture of the skin is altered, therefore, it will never be the same no matter what technique is used to remove it. My classes are full for 2005, but e-mail me and let me know if you would like to be on a waiting list. I have not yet completed the schedule for 2006. I read some of the questions that people asked you and I can relate my situation to the one girl who got her eyebrows tattooed and know she just hates them because they were done horribly. I've been searching to see if I can find someone to correct someone else's mistake on my face but I haven't gotten any concrete answers to my problem. I want to know if I could fix these two unshaped and long brown lines that someone drew on my face. I would rather have them removed from my face but I've heard laser removal makes you lose your eyebrow hair and I still have some and I don't want to lose them. Please write back. I need hope that I won't have to stay like this for many years. I'm only 19 years old and I don't think it's fair having to cover my eyebrows with my hair all the time and not be able to pull my hair back and all the things I used to be able to do before I decided to trust this mean lady who messed my face up for a $100. If someone charges you $100 for permanent makeup, you better run. Fortunately, the brows can be removed safely without laser. It may take 1-3 treatments and will cost a lot more to take off. I found your website recently when searching for some permanent makeup information, it is certainly the best and most professional I have seen! I have 3-4 freckles/sun spots (NOT MOLES) on the right upper side of my face(above cheek). They are all VERY small, the largest is just 3-6mm in size, the smallest ones are 2-3mm. Two of them (larger two) are a light/pale brown and are smooth/not raised. The other smaller two are a very, very pale and light brown, really very light and small. Would it be possible to camouflage them successfully? I understand a series of tests can be done before any permanent make up is applied, to determine what shade is best, and I have also read that many colors/shades can be mixed. My skin colour is fairly pale. As they are small and not too dark if at all possible I would certainly prefer for them to be camouflaged rather than removed by riskier means. Finally, on the other side of my face (near jaw) are two moles, which are again flat (or feel flat anyway) and are 3-6mm in size. They have not changed size/shape/colour. These are slightly darker than the freckles/sun spots. Could you please advise me if anything can be done for them regarding permanent make up. Thank you very much. I just wanted to ask before I make an appointment. All the best. Thank you very much for the compliments. I don't recommend permanent makeup to cover moles. We have better ways to get rid of them without scarring using a non-laser machine made specifically for that. Thanks. Let me start by saying that your site is VERY impressive, informative and EXTREMELY interesting !!! You look so very young for 20 years experience !!! :-) AND ARE SO VERY BEAUTIFUL !!!! This is my story ... 15 years ago, I went in for a DERMABRASION that was very badly performed ... Basically, the doctor went in way too deep and the results to MY HORROR, were 2ND and 3RD degree facial burns ... My wounds took over 5 YEARS to fully close ...IT WAS DEVASTATING !!! :( When they did heal a few years ago ... I ended up having very deeply scarred cheeks that seemed to cave inwards since they weren't at SKIN LEVEL ...At some places HYPERTROPIC... KELOIDS ... like a chalky white color ... and another thing is that the scars are VERY very very shiny !!! Needless to say... it looks VERY bad :( !!! Basically, I'm a MESS right now :( She said she will go lighten it up with the DILUANT she uses to LIGHTEN up the color, but I don't believe this will work ...Do you ??? Right now I'm VERY upset ...so I've decided to STOP and try to find ANOTHER solution ... The only good thing to come out of this is that the needle work seems to have helped the scars elevate almost to skin level AT CERTAIN PLACES!!! This is great news !!!!!!!!!!! And then last week BY SHEER CHANCE, I came across a site about NEEDLING ...(while doing research on scars and needles ... etc ) and have been EXTREMELY HOPEFUL ever since !!! :))) It seems UNBELIEVABLE though ...almost too good to be true ...CAN ( NEEDLING) really be PERMANENT ?????? I need a confirmation cause I can hardly believe it !!!???????? I am so sorry to hear about the horrible nightmare you have gone through. This is why you must always make sure the person caring for your skin know what he/she is doing and not use you as a guinea pig. Let me try to answer some of your questions. She said she will go lighten it up with the DILUANT she uses to LIGHTEN up the color but, I don't believe this will work ...Do you ??? I have never used DILUANT so I can't give you an honest opinion. Has she done anyone and can she show you any pictures of actual clients (not stock photo). CAN ( NEEDLING) really be PERMANENT ?????? Yes, the needling process can build up collagen, but it must be done more than once to achieve the desired result. Over needling may cause keloiding (hypertrophic scars). This is not something I can guide someone over the phone. Scars are different and the depth of scar must be taken into consideration when needling. How many times can needling be performed on such delicate scar-skin without causing MORE DAMAGE????? It can be done 8 weeks apart. Do you think it can somehow make the color lighten with the action of the NEEDLING? No. To lighten skin that has been tattooed, an acid must be used since needling alone won't work. Is there any course of action us poor souls can take???? Check references, look at the actual work, visit real clients, look at the portfolio, etc... And never ever go for bargains. Again, I am very sorry. Wish I could do more than just answer these questions for you. For now, pls don't do anything to yourself unless you can find someone reputable who can prove that they can help you. Good luck! You can use anything you like after your lips are healed. However, I don't recommend anything with exfoliation such as glycolic peel, etc... Too much exfoliation may fade out the permanent lip color. I am 37 years old and am currently undergoing chemo for breast cancer. I have lost my hair and most all of my eyelashes. I would like to know if there is a procedure to supply me with eyelashes that will look natural until mine grow back. I look like death without my eyelashes and eyebrows. Any suggestions you have would be greatly appreciated. I am sorry to hear about your condition. I have done many chemo patients including my sister. Permanent makeup will help tremendously for chemo patients. Lash extensions will work well if you have sufficient lashes to bond to, otherwise permanent lash enhancement (done in the lash line) will give the appearance of thicker lashes. Also, I suggest hairline stroke brows to give the appearance of hair on brows. I highly recommend permanent makeup for you. Hi, I am located in Long Beach, California. I am wondering if you ever come out to Southern California to tattoo make-up and eyelash extensions? Your work is the best I've seen and really would like you to do some work on me. I also have tattoos I want removed. Or maybe you have a location in Southern California that has trained with you. Thanks for your time and can't wait to hear from you. Thank you for the compliments. If you can bring together a group of 5 clients, I will come. I will need 1 month advance notice. I am very interested in eyelash extensions. However, I have very blonde short eyelashes and I am wondering if I am still an eligible extension candidate. I read on your site that extensions are made to match the natural lash color and mascara would not be necessary w/ the extensions; however, with very blonde lashes I would assume that I would still need to wear mascara. Is mascara still possible w/ extensions? Secondly, I now live in Louisiana, but return to Dallas often (about every 6 weeks) to visit my parents. Are touch-ups every 2-3 weeks essential? Or is it possible to wait 6 weeks or so between touch-ups? Thanks so much for your time. Your website is fantastic and very informative. Blond lashes can be tinted first or a black bonding agent can be used instead, therefore, you wouldn't need to use mascara. If you wait for 6 weeks, you may have to get a a new set then. I had my eyebrows tattooed over a year ago. By nature, I have very little hair all over my body (which is good since I don't need to shave), but that also followed me on my eyebrows. After having the procedure done, I was pleased with it. Now, looking back though... I wish I didn't do it. I'm Vietnamese and have been blessed with the "Asian skin", nice hair and all. I feel like this whole tattoo thing took away my niche. And by niche, I mean the natural look. I see that you've reiterated a couple of times to not remove a tattoo, rather to fix it. I'm not interested in fixing at all, I want to just revert a year after the procedure, is that possible? If so, how can I make arrangements to do it? if you would like to set up an appointment. I don't recommend doing a partial brow ever. The color will be very hard to match. The technician is not very experienced, otherwise she would have never suggested it. When a client asks me to do it partially, my answer is "you are paying for full brows, why ask for partial brows?". I don't recommend going back and risk getting your brows messed up since she didn't do it right the first time. I've already had permanent makeup done, and paid a lot for it. I just need a touch up on lips and eyes. I'm from Oklahoma. I'm hoping Texas is cheaper, since tattooing is illegal in Oklahoma. Please let me know. Yesterday, I removed a set of brows from a lady who had hers done from Oklahoma. The ink on her brows were bluish/black and the shape was very manly. She is one of many from Oklahoma whom have come to see me for correction. You can probably find cheap permanent makeup anywhere. If price is what you are looking for, you are probably going to regret it. My prices are standard, but my quality is outstanding. I cannot give you an exact quote since many who have come to me initially for a touch up usually decide to get the work corrected. I have very nice and thick eyebrows, however, I saw in some of your pictures a very very subtle way of tattooing that looked very very natural. My eyebrows are dark and I don't want to look like a clown, but would enjoy maybe having them a little bit fuller (wider)- is there something safe that you can do, like add hairline strokes (and what does this exactly mean - I read it on your website) Thank you very much. Hairline strokes are a very natural way of filling in your brows with little strokes to simulate the natural brow hair. I do 95% of this method on my clients when they request natural. It is nothing more than implanting pigment under your skin in little strokes rather than filling the brows in solidly. Take care. I am considering getting permanent eyebrows. I naturally have strawberry-blonde hair & fair skin. I've penciled in my brows for years & would like a permanent blonde/soft brown look. My major concern is what to expect as far as fading will go. I've been reading, so I guess in 5+ years I'd expect them to fade. Getting lighter is okay, but is it possible for them to change color (turn purplish or anything)? Is this something that should concern me? Thanks for your help! PS: Your site is the best I've found for this topic! I love it. Thank you for the compliments. If you want to go for the lighter blonde brows, it may need to be touched up a little sooner than 5 years since lighter colors tend to fade faster. One good news is that it may fade to a more natural light taupe or light grey color and not purple as you feared. Take care. I am sure it's not your lips that is causing you to not get a job offer. The spot can be easily fixed with micropigmentation. I love the look of eyeliner on my bottom lid, but I've never seen myself with eyeliner top & bottom lid. Can you show me what I would look like with regular eyeliner before I decide to do the top lid. Also, I like the bottom liner to be on the ridge about the lashes because my lids tend to show a lot of that area. Is that a problem? I have been looking forward to doing this for a while. Can you drive yourself after having this done? Thank you for the information! You can come in for a consultation and I can draw the eyeliner on you to show you how they look first. Liner on the bottom lids do not look good unless the top lids are also done, otherwise, you can have tired looking eyes. You can drive home after the procedure, but be sure to bring your glasses if you wear contacts. I just had a few questions for you regarding Tat Gone Ink (if you still or have ever used it). I have had 6 tattoo removals now and have only seen about 50% fading on a black tattoo on my right arm. I am considering having tat gone ink done, but I am still kind of iffy. Is the procedure effective? What does it do to your skin in terms of scarring? How long does it take? These are the questions I have, and if you could help answer any of them it would be a big help for me. Thank you very much. I haven't used Tat Gone Ink, but I have used another product similar to it. I can tell you that it works great and most of the removals that I have done are 100% gone within 1-3 sessions. I had eyeliner completed over 6 weeks ago and am unhappy with the results. The line has gaps, is grayish instead of black, and barely noticeable. The practitioner who did the work charges for "retouches". I am a teacher and must make careful financial choices. I'm wondering if I would be better off coming to you for correction now rather than returning to the original person and ending up with the same results? I would advise that you save your money and do it right. Why is she charging for work that wasn't done correctly? Please give us a call and I can see what I can do for you. I would like to have full eyeliner done (top and bottom). I was wondering what the average prices are and if you do any monthly specials or anything? Thank you so much! We usually do not offer monthly specials. If you want the best job for your face, please do not just look for specials. Most of my clients who come in with botched up work resent going to the wrong people for bargain prices. I was wondering what your minimum charge for tattoo removal is. I have one tattoo that I wish to have removed. It is about the size of my little finger's nail bed in size and a homemade job from 16 or so years ago on my hand (back when I was 15 and didn't realize that hand tats were a sign that you were either in a gang or prison before) I am going on 35 and going back to college to be a mortician and as much as I like my other tattoos, they can be covered in a business setting and I am tired of people asking me where I spent time. Thank you for any information you can tell me ahead of time. Tattoo Removal starts at $250 per square inch. I can't say for sure without seeing your tattoo. I have a very high success rate for tattoo removal. I had full lip micropigmentation at a Dermatologists office by a young lady. After the first treatment my lip line was very uneven and so was the overall color on the lips. As I was told this is normal, I didn't panic. After six weeks she scheduled me for the second procedure. Not only is the overall color uneven, but my lip line is crooked and looks like bleeding lipstick. The device used to implant the color has three prongs and it looks as though she may have turned the instrument sideways from my lip line and there are little dots of color floating all by themselves intermittently outside my natural lip line. The color also has a bluish tint. NOW I'm in a panic! She claims that my lips are uneven because I swelled and she has had no other patient or client complain about her work. She said she has never done a correction on color, but she will consult with her teacher to see what she should do. I'm afraid to trust her since it's obvious she is very inexperienced. Yes, I did ask how much experience she had and was told that she has done many, many people with success and I thought since this was a wonderful dermatologist behind her I would be safer. Mind you, this is no ordinary dermatology office, it's a high end spa as well. When I went in for them to see my lips, and the doctor looked at my lips and asked her if she would be able to correct my lip line and she said, "Oh sure, in about fifteen minutes!" I'm scared to death to trust her at this point and to be honest, I don't think she could possibly correct them if she hasn't done so in two sessions. They claim that they are not responsible for the results on my lips, but she did say that the doctor could do chemical peel or even laser to straighten out the uneven lip line, but of course I will have to pay for it. What in the world have I gotten myself into? Any advise? I don't have that kind of money. I know you must be very busy and probably get many requests for advice, but I'm so afraid that I'll be forced to live with my uneven, slightly blue lips. Thank you for your time and any suggestions you might have. I am so sorry about the difficulties that you have had to go through. It's very sad that some doctors employ technicians who just aren't skillful enough to do these procedures correctly and artistically. I have had performed so many corrective procedures from clients who had gone to technicians who work at high-end medical spas, doctor clinics, beauty salons, and even tattoo parlors. So just because a high-end medical spa or doctor's clinic may offer permanent cosmetics does not mean that you will get quality work. But to answer your questions: No, uneveness of color after the procedure is absolutely not normal. Swelling is normal. Your technician is definitely not experienced in performing lip procedures and it sounds like her technique is incorrect if there are floating dots of pigment outside your lip liner and the color is uneven. There are only a handful of technicians out there who can successfully implant color into lips. I would not laser those lips as some tattoo pigments contain titanium oxide which may turn your lips black. Chemical peels will not do the job either. My advice is to stay away from that technician and even if they offer to correct it for free, do not go back. If she has to consult with her teacher about performing corrective work, that definitely should trigger a warning sign that she just does not have enough experience. I highly recommend that you find someone who knows how to do tattoo removal using enzyme method or has actually performed corrective work on the lips. You must see their portfolio and samples of their work as well as get references who you can speak with and visit with if possible. Good Luck and Take Care. As you can see I am very disappointed. My story is like many of the individuals that leave horror stories on your question board. I had my eyebrows done in October of 2005 for a whopping $100 bucks....OK, my fault I should have done better research. Nonetheless, here I am 3 years later with pink eyebrows that look like they were stenciled on. I have been looking for someone for about 2 years now to safely remove them. I have fully grown my brows back. I am concerned about 3 major things. 2. Permanently losing my hair/damaging my hair follicle. 3. Based on my photo's attached, how possible will it be to completely remove the pink. It totally defeats the purpose to remove this mess, and then I can't grow any brows. I have read your credentials, and have seen your pic's and I am truly impressed. I am not sure whether or not I am interested on going down this path again as far as correction. I would like to see if I can accomplish my main goal which is to just remove this horrible mistake, and have my old self back again. I am in Buffalo NY. I can see your dilemma, but it is an easy fix for me. I have many photos for you to see that is much scarier than yours and I am able to fix them. I had a client from Oklahoma who is a very dark skin African American who attempted to have a doctor laser her brows off 5 times and was left with fluorescent orange eyebrows and since they were lasered she also lost all of her brow hair. I was able to correct her brow color and shape and gave her beautifully simulated hairline brows. She was completely amazed and very happy. Yours are not nearly as bad and you still have hair. I will able to correct them and also give the brows a fuller hair appearance while preserving all of your brow hair. I have so many clients that come in from all over the country. As a matter of fact, I just had two more come in from Arizona yesterday with crazy brows. One was done 4 times with so many colors and one higher than the other. She was the pickiest client ever (although who can blame her after all she went through?) but she also left completely satisfied. I even had one client that had 30 re-touches until she found me. This one looked like a stroke victim because the permanent cosmetics was so messed up. She was so happy with the correction that I did for her that she actually gave me a mink coat for Christmas. Anyway, coming from New York is still closer to Dallas than others who have come from Canada, India and other countries to see me. I can guarantee that you will be very happy that you made the trip to see me here in Dallas and soon to be second location in Plano. Please don't hesitate to give me a call if you have any other questions. 1) If I understand you, you would remove the tattoo pigment first. I understand from your website that sometimes this cannot be accomplished in one visit. However, even if it didn't remove it all, would it possibly fade enough for you to correct as you stated below? 2) What's your opinion on those tattoo fade creams? I ordered Tattoo-Off (but never used it because I thought I found that corrective specialist. Would that fade it enough for me to come out and have it corrected? I've attached a picture - though a little blurry to give you an idea of what you'd be working with. If I could get an idea of the number of visits it would help. Thanks again. I had permanent color done on my lips several months ago. I am 52 years old and I feel I made a bad error in judgement. The color and the shape are exactly what I asked for, which is great. The only problem is that I don't like it. It is too dark and it hasn't faded at all. I understand that laser treatment removal will not scar and I'm leaning toward having it done. Could one treatment work for my color? I had her match the color of the inside of my mouth so it is in the red family. I had the procedure done in Midland, TX where I live. There are two things I need to know before I make an appointment with you. 1. I usually tolerate pain very well. But this was more than I bargained for. The pain was so terrible that I almost left in the middle of the procedure. Yes, she applied topical deadening but it didn't help. I don't want to suffer through that much pain again, so if the laser removal is that painful I won't consider having it done. I had 4 treatments of fraxel on my face before the permanent lipstick and the girls assured me that the pain would be no worse than the fraxel. That was completely false. The fraxel hurt, but it was well within my pain tolerance. 2. If there is danger of scarring with the laser I also won't consider having it done. I would appreciate your candor. I have attached a picture. Thank you so much for your valuable time. I have performed so much corrective permanent cosmetic procedures that I understand what you are going through. However, your lips don't look bad. From the attached picture you sent, I think that technician did a good job. If it's too dark, we can tone down the color without removing it. If you look at my portfolio on line, you can see how I toned down purple lips to a nice beautiful pink color. DO NOT use laser to remove permanent cosmetics. It can scar and I have had so many clients who tried to remove botched up permanent makeup with laser and had disastrous results. Not only can it scar but sometimes it can change the color of the pigment rather than remove it. I had one client come in from Oklahoma who had tried to remove permanent eyebrows using a laser. Not only did it scar, but it also changed her brows to a bright orange. Fortunately, I was able to correct the color without removal and she was very happy. As for the pain, I do use two types of topical anesthetics and I am very light-handed so my clients do not have an issue with pain. If you have any questions, please feel free to give us a call. Do you do permanent blush? I know how to do it, but I do not recommend it. It is a procedure that can break your capillaries and could hinder you from future laser treatments should you decide to do skin rejuvenation. I just wanted to know the price for full lips & I wanted to know if "full lips" includes the lining of your lips naturally because it is part of your lips? I'm picky when it comes to lip color because I'm a "caramel sometimes known as yellow" light skinned black woman & my lips are a pale pink while my sister's are a bright medium pink. I attached a picture as a example of the color. Do you have a color similar to this shade? Yes, I have that color. I can mix about any color you want. However, the picture you sent me does not have a healed result. Most pictures from technicians who do not have healed results are not reliable. Not many technicians out there can actually do permanent full lips and get the color to stay. If you look at my portfolio, all the pictures have before, immediately after, and healed. Some clients who have come to me to redo lips usually have either crooked lips, uneven blotchy color, or have had their lips done several times without success. The price for my full lips for 2008 including lip liner is $1,300 and without is $750 but prices may go up in the future. I usually do lip liner the same color as the full lips and blend it in. What's nice about the liner is I can augment the shape of your lips and correct the cupids bow or make the lips look fuller or thinner without cosmetic surgery. I can also even out lips that are naturally uneven. If you are African American, you need to be careful about doing full lips since you can hyperpigment easily. You may need to come in for a consultation and let me see if you are a good candidate. Thank you so much for the kind words. Lash extension is another one of those procedures that are not regulated, and therefore, anyone can be a self proclaimed expert. So beware. When I first offered lash extensions more than 10 years ago, no one knew what it was and now everyone is doing it. And those who proclaimed themselves to be lash extension gurus were only putting on lash tabs. Lash franchises are popping up everywhere in the Dallas/Fort Worth metroplex with technicians who are not even aestheticians or at least licensed in cosmetology. The only advice I can give you is to find a reputable place that offers it, make a visit and ask to see a repeat client who's got it done there at least several times before and ask to look at the technician's portfolios. Good luck! I know that you are very busy. I sent out an e-mail to a place in Little Rock 6 months ago and they never responded. I have spent over 2000.00 so far and people have done nothing but make me look like a freak, then they try to remove it and redo and remove and redo, and they just keep charging me to fix what they messed up in the first place. They try to make me believe that it isn't that bad, that I am too picky. It is a nightmare. Honestly I don't know how they sleep at night knowing how they mess up peoples faces and take their money. Everyone comments and can see what a horrible job was done but they won't admit they did anything wrong. I am sure I have some scarring. Do you see a lot of scar tissue and can you work over that? I just did yet another removal procedure 2 weeks ago and he didn't get it all and it looks like he went out farther on my skin than where the ink was. Can I ask your method of removal and are you usually able to get it out? This guy breaks the skin with the needle and then he basically tattoos the broken skin with this natural sea salt solution. Then the skin forms a scab and when the scab heals and falls off the ink is pulled out of the skin. Oh my goodness, the pain I have endured, needless to say how ugly it is to have scabs for lips and eyebrows. He removed dark ink blots from my lips and after they healed he was suppose to reline my lips and he made them worse than the first person that did them. He went way out of the lip line and it was all jagged and smeary. One side larger than the other. Horrible I tell you. This is the third time he has attempted to remove the mistakes that he made and he wanted to charge me again. I said no because I paid him to do my lip line and he just butchered them. Thanks again for listening. I am looking forward to meeting you. Take care and bless you for giving people their faces and confidence back. I am native/african american with yellow/tan skin. I have eczema and because of my eczema I don't have any color in my lips. I am interested in getting permanent lip color but I'm relucant to get it done because I have eczema. Sometimes I get eczema of the lips/face/body and they can get dry and bumpy but go away after I use hydrocortisone ointment. I was going to get full lip color done back in 2004 so I had a test spot done behind my ear and it's still there and I never had any adverse reactions. Do you think it's safe to get permanent lip color? Thanks. I am a 22 year old male with moderate acne scarring, prominently icepick type scarring. I was curious to know what services you offered that would benefit me most. I have already undergone 4 fraxel procedures and did not see any difference. It might have even made my skin texture worse. I am mostly curious to know weather or not you do the dermarolling procedure and what your experience was with that. If you could please get back to me I would greatly appreciate it. Thanks. Icepick type scarring is very deep, therefore, the fraxel process you went through would not be able to help. Our process is a combination of needling and laser which can go a lot deeper, but the process is in a series of treatments. Our needling method is a similar process to the dermarolling procedure; however, needling can go much deeper and targets more on the scars. After the treatment, we followed up with the non-invasive laser treatment which help the skin heal, reduce redness and build collagen. I am wondering if it is possible to remove permanent eyeliner. My eyeliner is very thick, uneven and has these awful looking "wings" on the ends. I am really desperate to have it removed. I tried a laser procedure on my eyes, but it didn't work at all and cost a fortune for just one treatment. Can you let me know if you offer any kind of solution and tell me about it?. It is possible to remove permanent eyeliner and I have removed and corrected many botched permanent eyeliners as well as other botched up procedures. When removing permanent makeup, I never use laser to remove the pigment due to the potential damage to hair follicles and risk of eye damage if trying to remove permanent eyeliner. I have also had many clients who had tried the laser removal on permanent makeup and it made it worse by changing the color of the pigment and even spreading out the ink particles making the area to be removed look more blurry. Some have even lost brow hair and lashes permanently from the laser removal. My technique to remove the pigment doesn't do any of that, it draws the pigment out. Now having said that, I have found that for those who had initially tried to remove their permanent makeup via laser, I have a harder time removing their botched permanent makeup. But it still can be done. The best option for you is to come in for a consultation to see your eyeliners. There may be other options to correct if removal is not a feasible option.